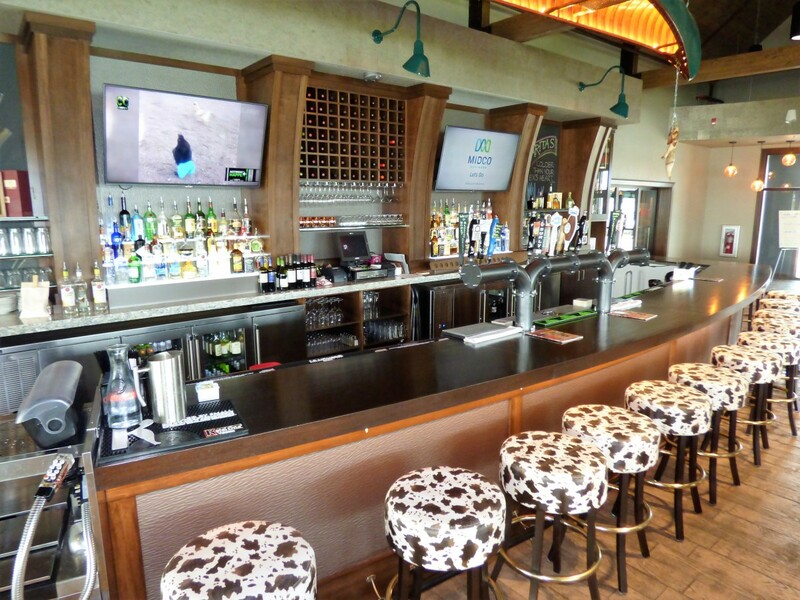 Drifters Bar & Grille sits on the Missouri River in Ft. Pierre, SD and Creative Surfaces is excited to have been able to assist them with custom upscale bar cabinetry needs. On this project we used solid poplar and maple veneer cabinets for the bar, POS stations, and hostess stand with open shelving and Formica 180fx “Cafe Azul” plastic laminate countertops. The face of the hostess stand showcases panels of Formica decometal “Brushed Umbra”. 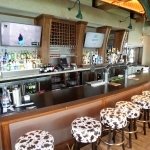 The bar has a 40 1/2″ half wall with Formica decometal “Umbra Craft” face panels, purse hooks and a brushed nickel footrest; showcasing a solid Mahogany countertop. The back bar features adjustable tempered glass shelving, wine cubbie with stemware racks, LED puck lighting and Cambria quartz “Praa Sands” countertops.